Taking a couple of hours TOIL (Time Off In Lieu) from work meant i had a whole afternoon to myself. 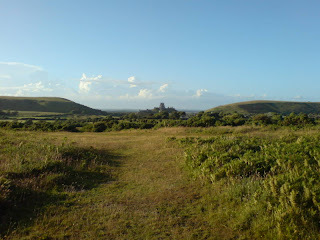 I decided to go for a walk over the Purbeck Hills. The weather reports on the radio threatened rain but the lowered sun visor and temperature guage in the car sang a different tune. Was it going to miss us completely or sneak up and dump on me later in the day? I packed the Jiri 35 with wet/cold gear and a stove for a hot dinner just in case and for some perverse reason i hoped for bad weather to justify carrying it all. I needn't of bothered. Instead i fried and sweated for five hours. Stepping out the car i realised that not only had i forgotten the camera (mobile phone to the lower-resolution rescue) but that i'd left the map at home. I could see it in my minds eye, laughing at me, sat on the floor where I had packed my bag. That meant sticking to a well known circuit of the hills but two minutes out of Corfe and i was already 'off map' deciding to find a new route up to Kingston. Half an hour later i was drenched in sweat and heading along to Swyre Head into the stiff breeze whistling along the Jurassic Coast. My planned route, heading inland to climb Creech Hill was thwarted by closed access to the military ranges that Creech sits on the edge of. Second choice was to head south down to Kimmeridge and the costal path which i could follow east towards home. It was very overgrown, steep and difficult walking. The remoteness was amplified by the lack of people, the fierce wind threatening to knock me over and the trecherous, subsiding cliff top. At times the path puts you 18 inches from certain death. After a few miles I decided to stop for a breather. A fresh brew and noodles warmed up on the AGG revitalised me for the final few steep pulls up to the inland path and the undulating push back to the car although the zigzagging search and rescue chopper reminded me that whilst i had had a trouble-free excursion others hadn't been so lucky. On the way back the view of Corfe Castle across the heath, standing guard between the 'barrows' signals its nearly time to rejoin society. 13 hot, sweaty miles and my feet are still getting used to the Roclites. Much cooler, grippier and way lighter than my boots but your feet have to get used to them and the final mile of tarmac burned my soles. I was beat when i got home but glad i had got out. The map I had forgotten was waiting for me on the bedroom floor, probably upset that I had returned safe and hadn't got lost.